ONE SMALL STEP FOR ABC NEWS, ONE GIANT STEP FOR SOCIAL MEDIA MARKETERS. Home/Blog, Branding, Red Lips Media, Social/ONE SMALL STEP FOR ABC NEWS, ONE GIANT STEP FOR SOCIAL MEDIA MARKETERS. Never in history has social media been more relevant to a Presidential election than in the 2016 race to the White House between Hillary Clinton and Donald Trump. Memes popping up all over the place, celebrities were endorsing their candidate via Instagram and results were being live-streamed through Facebook Live. The election taught us a few important marketing lessons, but none more so than the infiltration of our Facebook Messenger app by ABC News. Clever marketing is now the standard for these large organisations – innovate or perish. It’s not just enough to send an email, or update an app or expect people to come to your website anymore. People have the attention span of a goldfish and they are expecting you to keep them entertained. 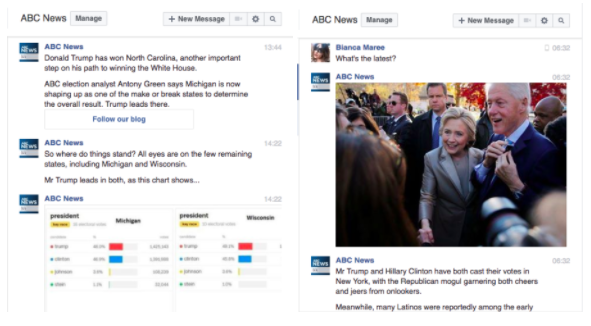 ABC News’ latest initiative involves a fully integrated news subscription service that arrives straight into your Facebook Messenger. News updates in real time straight to your Facebook Messenger app on your computer, iPad or even on your phone. A remarkable feat in itself. The important lesson to learn from this situation is that you – as a business – need to keep up with the consumer. News is a particularly interesting conundrum. The industry itself has been in decline for some time now. People are not reading newspapers anymore, and – thanks to a little thing called Netflix – people are opting out of television news too. Then came online news. People began to consume news from online portals and would subscribe to their email services. Now the question is, how many people actually read all of their emails anymore? Email service providers are becoming smarter. Gmail has effectively put your content in the background by separating inboxes into three different tabs. Your emails are more than likely relegated to the “promotions” or “social” tab. So the next step for brands who are struggling to find cut through? Where are people spending most of their time? ABC News now has a service where you can opt in, make category selections and receive news updates all in the Facebook Messenger app. Injected with humour, the service is news created for Millennials. This is how brands should be thinking in 2016 and beyond. You need to assess where your people are living? Is it Snapchat? Is it forums? Figure out where they are, and you will figure out where you can inject funds your marketing budget so that it will be the most effective? Marketing is a constantly-evolving game, and it’s up to you to keep up.